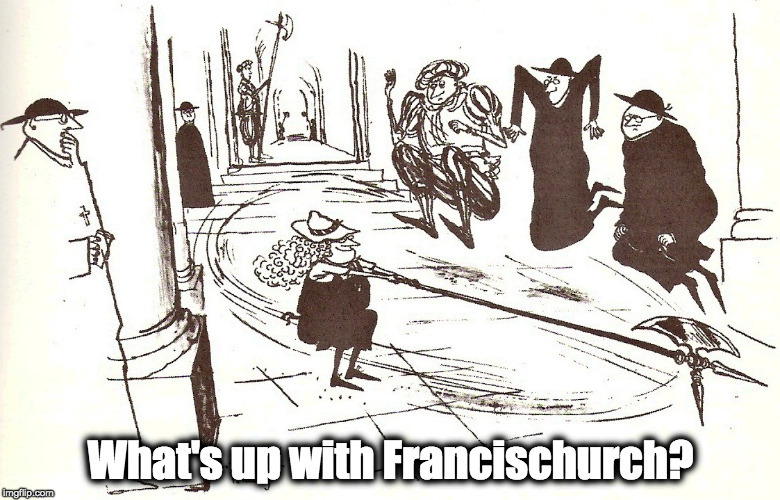 How to resist Vatican criminals like a boss… – What's Up With Francis-Church? Just a suggestion that comes to mind regarding possible responses by monasteries of contemplative nuns concerned about maintaining the integrity of their charisms in the face of the demands of the Congregation for Religious. …the Franciscan order of friars has found itself mired in a financial scandal allegedly involving fraud and embezzlement of tens of millions of euros. A branch of the Roman Catholic order had invested some of its money in offshore shell companies based in Switzerland, which had in turn been involved in arms and drugs trafficking, Italian media reported. A three-month-long internal investigation has found extensive financial irregularities at the heart of the Rome-based order, which has around 14,000 members worldwide and owns churches and convents in more than 100 countries. Michael Perry, the American head of the Order of Friars Minor, took the unusual step of writing an open letter to friars and monks to inform them that the historic order now finds itself in a “grave situation”, with millions of euros believed to be missing from its accounts. The general treasurer of the order had resigned, he said. “Brother Perry, who is from Indianapolis, was elected in May last year, succeeding Jose Rodriguez Carballo, whom Pope Francis appointed the head of a Vatican body – the Congregation for Consecrated Life. Gravely compromised men, men against whom credible public accusations of grave crimes and misdeeds have been made, are the easiest of all to resist.